Howard Post, Finding #37, Oil on Canvas, 24" x 30"
In third grade Howard Post decided to become an artist. When he was told he couldn’t make a living as an artist he became an illustrator. That career exposed him to many different approaches and subjects and taught him discipline. “You can’t sit around waiting for inspiration,” he says. Today, this native Arizonan is considered a master impressionist who shows the contemporary West in a modern fashion. For over 30 years Post has created a reputation for his consistency in subject matter and approach. Since this path has proven successful he figures why change. “Not too often do I just do a pure landscape. Most often they’re fences, animals, or working cowboys,” Post explains. Howard Post, Behind the Working Chutes, Oil on Canvas, 30" x 24"
While landscapes have been a common, almost incidental, element in his oil paintings, recently they have become the focal point. Medicine Man Gallery will spotlight Post’s latest work in a solo show that opens Aug. 1 at its showroom in Santa Fe, N.M. Titled The Western Landscape, this exhibition will feature a variety of pieces that range in size from 18 by 24 inches to 60 by 48 inches, his largest oil. All of Post’s paintings are based on real images and photos he has taken while traveling around the country. Following an impressionistic – even a post-impressionistic – style he aims to convey the contemporary West as he knows it. Although inspired by actual places, his work reflects universal scenes. Post is noted for his use of simplified design and a limited palette that takes otherwise mundane subjects and transforms them into visually interesting images. “Over the years I went from literal use of color to adding a personal sense of color to it,” he says. Many of his paintings take on an abstract appearance but not in the sense that elements are unrecognizable. An ideal example of this can be seen in his latest piece titled Behind the Working Chutes. Known for his unique aerial perspective and sun-drenched hues, Post’s work is defined by orderly, strong shadow patterns cast by the figures of cattle, cowboys, trees, or fences. 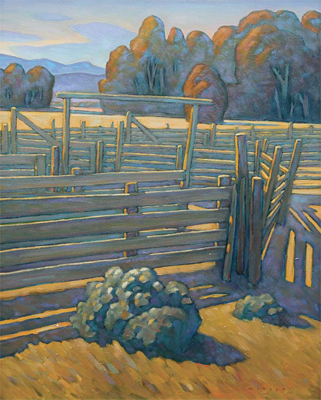 In his new oil, Leaving the Barn, Post interplays with several of these elements while incorporating geometric patterns of the corrals and insinuating the presence of the building. 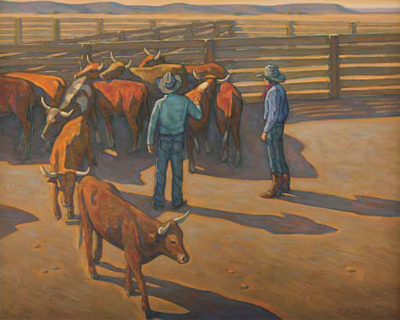 Howard Post, In the Bull Pen, Oil on Canvas, 24" x 60"
In Finding #37, what’s interesting is the movement of the cattle. These cattle become a geometric abstract shapes that create a movement there and the patterns of shadow and color. That’s what captures my interest initially,” he says. Post frequently turns his figures and animals away from the viewer and Out West is no exception. Based on an actual encounter, the pose of the mule struck a chord with him and inspired this rendition. 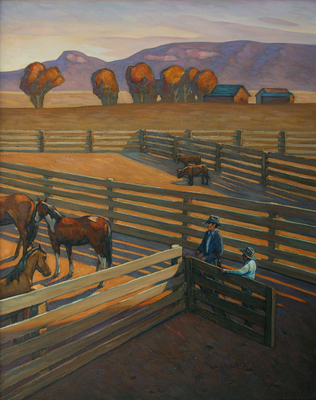 Howard Post, Spotted Stray, Oil on Canvas, 24" x 60"
Post’s painting In the Bull Pen differs from past work in his unusual use of negative space that emphasizes a solitary border collie herding cattle. Such quiet scenes appeal to collectors of Post’s work, many of whom are sophisticate art aficionados who frequently praise his use of color and the natural design qualities of the pieces.